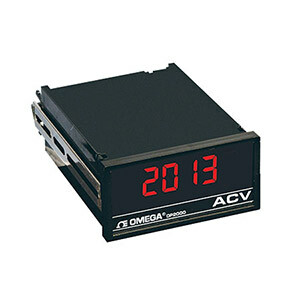 From March 19th, DP2000/9000 AC Voltage and Current models have been discontinued. As a possible substitute, please check out the DP20 Series for details. The DP2000/DP9000 AC AVG voltmeter and ammeter use a precision op-amp rectifier circuit to provide an economical AC-average meter, which is calibrated to display the true-RMS value of sinusoidal signals. The AC RMS voltmeter and ammeter use an integrated circuit that computes the true-root-mean-square value of complex waveforms. Screw-terminals are provided for AC or DC coupling. AC coupling allows the measurement of the AC component or ripple from a signal with both AC and DC components. DC coupling allows the measurement of true-RMS, including both DC and AC components. The signal conditioner provides six current ranges, as determined by an internal shunt resistor. In addition, there is a special 5 A range, which allows direct connection to a current transformer (CT) with 5 A secondary, without need for a stepdown transformer. Proper scaling can be for any primary current. An 1/8 DIN case houses each meter. Choose any combination of display type (LED or LCD), operating power, input type and range, analog output, and digital or control outputs.